Optimum Carbon Black Level for Maximum Impact Energy in Rubber - Tavdi Company, Inc.
Not all rubber compositions are the same. 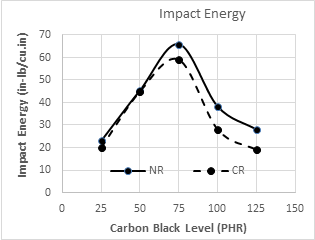 It turns out that there is an optimum level of carbon black for maximum energy absorption capacity. One of our clients ran a series of tests on their Advanced Yerzley Oscillograph (AYO-IV) for Natural Rubber and Chloroprene Rubber at five different levels of carbon black. Their results show a definite maximum impact energy absorption level at 75 parts per hundred of rubber (PHR). Dynamic parameter tests are quick and easy on our Advanced Yerzley Oscillograph, taking just two to five seconds with results evaluated instantaneously. The Advanced Yerzley Oscillograph (AYO-IV) satisfies the requirements of ASTM D945-12 and can be viewed here.